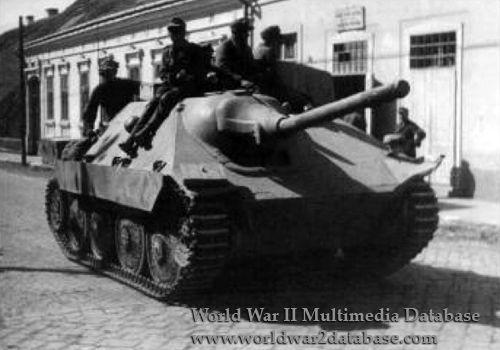 A Jagdpanzer 38(t) (SdKfz 138/2) "Hetzer" tank destroyer number 132, part of a mixed column of tanks, mules and horses of Heeresgruppe Sudukraine (Army Group South Ukraine), moves through a town during the evacuation of surviving German forces during the Soviet Jassy-Kishinev Strategic Offensive Operation. The propaganda value of this photo is that the forces of Heeresgruppe Sudukraine appear to escape to Hungary, when the actual situation was that the Soviets successfully prevented most of Heeresgruppe Sudukraine from escaping Romania. The Soviets effectively destroyed Heeresgruppe Sudukraine and opened the way for the Soviet Union to enter Romania and force that nation to switch allegiance from Germany to the Soviet Union. This "Hetzer" was manufactured in June or July 1944 by BMM. The Jagdpanzer 38(t) ("t" for Tschech or Czech) was based on the Skoda Works' Panzer 38(t), known as LT vz.38 before the Germans completely took over Czechoslovakia in April 1939. Superior to the German Panzer I and II, by 1943 German forces were having serious trouble competing with the Soviet T-34. Colonel General Heinz Guderian demanded a better tank destroyer, capable of defeating the T-34. The stopgap open-top Marder I/II/III series had limited mobility and exposed the crews to small-arms fire. The Jagdpanzer 38(t) was cramped and unpopular with crews because the right-mounted gun also loaded on the right, reducing the rate of fire. Four crewmen were squeezed into the hull, and the commander had trouble seeing over the top of the tank if the panzer was in a hull-down camouflaged position. Despite these shortcomings, it was a formidable opponent for the Allies, because its small size and low profile, combined with its long-range 75mm (3 inch) gun, often gave the first shot to the Hetzer. Historians debate over whether the name "Hetzer" was adopted during or after the war. Skoda continued to manufacture the Hetzer after the war, and Sweden operated the type for several decades.